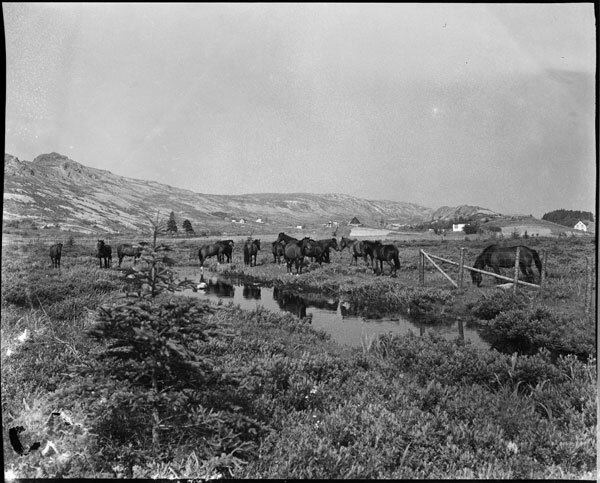 The SPCA which was established in Newfoundland in November 1888 was originally formed to eradicate this practice and other cruel hardships that the horses had to endure such pulling excessively heavy loads. Recommended Archival Collection: At The Rooms Provincial Archives: MG 593 is the SPCA Collection 1912 -1927. It consists of correspondence; complaint books, and investigation reports into complaints of cruelty. This entry was posted in Archival Moments and tagged animals, horse, SPCA on November 29, 2018 by Larry Dohey. Upwards of 130 horses were entered into the parade that looped past the post office along Water Street to McBride’s Hill, thence to Duckworth Street and up Cochrane Street to Government House grounds where the exhibition was held. For many the parade was seen as a distraction from the seriousness of the conversation about the ‘Great War’ that had been called a month earlier. On the field at Government House the animals were taken to their allotted spaces and the judging was done by some of the leading citizens, the gentlemen and ladies of the town, including his Excellency and Lady Davidson, the Premier and Lady Morris. Judges had to choose the best horses in a number of categories including; “Heavy Draft Horses”, won by “Ben” driven by J. Morrisey; the “Truck Horse” that had to driven and owned by truckmen was won by “Charlie ” owned by John Fowler; “The Express and Delivery Horses” category was won by “Bruce”, owned by M. Fleming; “The Cab Horses”, category was won by “Stella” owned by A. Symonds. There were also categories for farm horses, ponies and an old horse category. The Society for the Prevention of Cruelty to Animals (SPCA) that was established in Newfoundland in November 1888 was always seeking new ways of bring attention to their cause. The parade of horses was in September 1914 a success but because of the Great War (1914-1918) what may have been a grand tradition was interrupted after only one year. The parade also stands as a symbolic divide between the old and the new. It was in 1914 that motor cars or automobiles began to take the place of the horse. The shift from horse to motor car was so evident in St. John’s that the Editor of the Twillingate Sun in July 1914 felt obliged to write an editorial about the phenomena. Recommended Archives: Search the Rooms Archives online database for descriptions of our archival records and to view thousands of digital photographs. Click the image to begin your search. https://www.therooms.ca/collections-research/our-collections Try this in the search bar type Horse. This entry was posted in Archival Moments and tagged cabman, drivers, horse, SPCA on September 8, 2018 by Larry Dohey. Recommended Web Site: Society for the Prevention of Cruelty to Animals – Please support the SPCA on line auction: http://spcastjohns.org/ Please click on the advertisement line above. This entry was posted in Archival Moments and tagged animals, horse, SPCA on November 28, 2017 by Larry Dohey.